Chicken is one of the most desired foods by canines. Almo Nature Legend Chicken Drumstick Adult Canned Dog Food is no stranger to healthy food. Its formula is made from minced, hormone-free chicken. The ingredients also includes a small percentage of fiber-rich rice, no added colorants, preservatives, supplements or bulking agents. 55% of cooked meat or fish is naturally preserved in its cooking water plus 3% of rice. Includes high-quality enriched vegetable and tapioca fibers. Formula is intended for small, medium and large adult breeds. The formula is a supplement for special gluten-free, grain-free, corn-free, wheat-free, and soy-free meals. 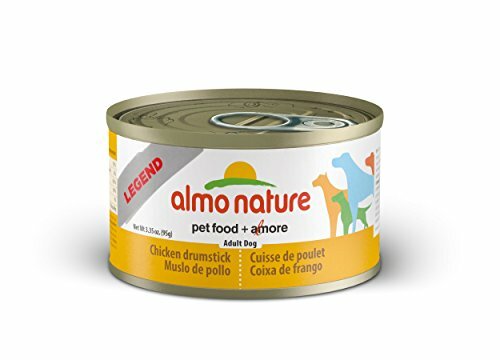 Please be advised that Almo Nature Legend Chicken Drumstick Adult Canned Food is intended for supplemental diets only. A complete and balanced diet must be served daily in addition to Almo’s chicken drumstick formula. Chicken Drumstick, Chicken Broth, Rice. Almo Nature’s formula is intended for supplemental feeding only. The food must be mixed with a complete and balanced diet. Depending on your dog’s size and breed, make sure you mix Almo Nature’s can food with your dog’s normal regular meal and diet serving. According to your dog’s appropriate serving size, his/her plate will be a little bit bigger because the supplemental food will bulk the bowl. If the food is too much, you might want to mix the formulas and serve your dog half for the meal. You should refrigerate the remaining portion and feed it to your baby during his/her next meal. Since this formula is a supplement food source, the amount you feed to your dog can vary because it will be mixed with the regular meal. As if any change in food and/or diet, you should check with your dog’s veterinarian first to make sure this change goes well with your pooch and ensure fresh drinking water is always available. 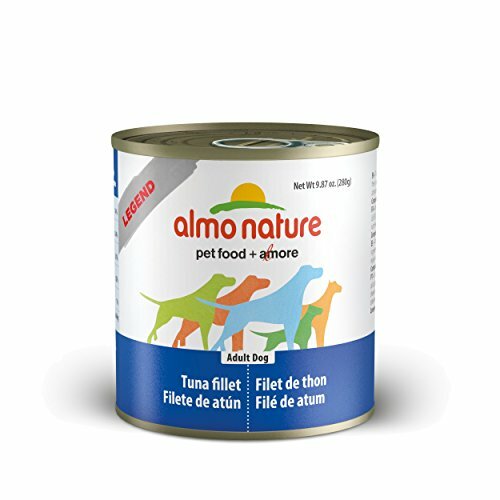 Almo Nature Legend Dog Food is made from hormone-free chicken containing vitamins and minerals. Rice makes a tiny percentage of the formula which carries added fiber, lysine, and magnesium. The high-end packaging standards are compared to human packaged foods made with no added preservatives, colorants supplements or bulking agents. If your little one is experiencing tummy issues or is allergic to grain, gluten, wheat, corn or soy, then Almo Nature Legend Chicken Drumstick Adult Dog Food might be a good start. Other formula flavors include but are not limited to tuna fillet and chicken and rice.